From the North (Cleveland/Akron): Take I-77 South to the Tuscarawas St. exit. Turn right off the ramp onto Tuscarawas St. and follow the hospital signage. Turn left onto Dartmouth Ave. The College is located on the corner of Dartmouth Ave and 9th St. SW. The Aultman parking deck may be accessed off of 7th St. SW.
From the South (Carrollton): Take I-77 North to the Tuscarawas Ave. exit. Turn right on Tuscarawas Ave. Turn left on Clarendon Ave. and follow the hospital signage. Turn left onto Dartmouth Ave. The College is located on the corner of Dartmouth Ave and 9th St. SW. The Aultman parking deck may be accessed off of 7th St. SW and Clarendon Ave SW.
From the East (Alliance): Take US Route 62 West to I-77 South. Once on I-77 South, exit at Tuscarawas St. Turn right off the ramp onto Sixth St. and follow the hospital signage. Turn left onto Dartmouth Ave. The College is located on the corner of Dartmouth Ave. and 9th St. SW. 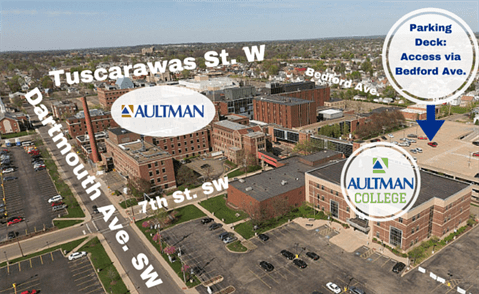 The Aultman parking deck may be accessed off of 7th St. SW and Clarendon Ave SW.
From the West (Massillon): Take US Route 30 East to the Harrison Ave. exit. Turn left off the ramp and proceed to 9th St. SW. Turn left. The College is located on the corner of Dartmouth Ave. and 9th St. SW. The Aultman parking deck may be accessed off of 7th St. SW and Clarendon Ave. SW.